The brave, wry, irresistible journey of a fiercely independent American woman who finds everything she ever wanted in the most unexpected place. Shufu: in Japanese it means “housewife,” and it’s the last thing Tracy Slater ever thought she’d call herself. A writer and academic, Tracy carefully constructed a life she loved in her hometown of Boston. But everything is upended when she falls head over heels for the most unlikely mate: a Japanese salary-man based in Osaka, who barely speaks her language. Deciding to give fate a chance, Tracy builds a life and marriage in Japan, a country both fascinating and profoundly alienating, where she can read neither the language nor the simplest social cues. There, she finds herself dependent on her husband to order her food, answer the phone, and give her money. When she begins to learn Japanese, she discovers the language is inextricably connected with nuanced cultural dynamics that would take a lifetime to absorb. Finally, when Tracy longs for a child, she ends up trying to grow her family with a Petri dish and an army of doctors with whom she can barely communicate. And yet, despite the challenges, Tracy is sustained by her husband’s quiet love, and being with him feels more like “home” than anything ever has. Steadily and surely, she fills her life in Japan with meaningful connections, a loving marriage, and wonder at her adopted country, a place that will never feel natural or easy, but which provides endless opportunities for growth, insight, and sometimes humor. 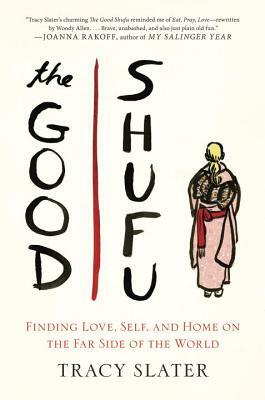 A memoir of travel and romance, The Good Shufu is a celebration of the life least expected: messy, overwhelming, and deeply enriching in its complications. Tracy Slater is the founder of Four Stories, a global literary series in Boston, Osaka, and Tokyo, for which she was awarded the PEN New England’s Friend to Writers Award in 2008. An essay on her bi-continental life was published in Best Women’s Travel Writing 2008, and her writing has appeared in The Boston Globe, Boston Magazine, The Chronicle Review, and the New York Times Motherlode blog.